Construction of the residential development Lunar - 28 kilometres south of Sydney - is scheduled to begin mid 2017. The boutique project will feature 64 apartments, a basement carpark and a communal landscaped garden. 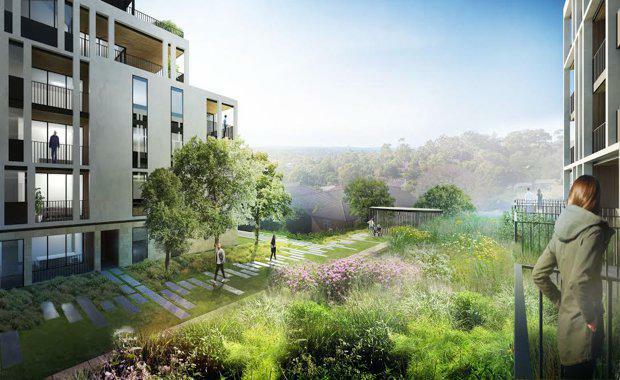 Ben Pomroy at Rothelowman said the design for the new development was derived as a response to natural surroundings, and to optimise the apartments’ long-distance views. Rothelowman said the design "harnesses the natural characteristics of its surrounds". “Lunar sits on one of the highest points in the Sutherland Shire, with views north to the CBD and Botany Bay, our scheme had to take advantage of these opportunities, whilst developing a design that addressed and was respectful to the public domain,” said Mr Pomroy. “Our desire was to create a building that embraces the shire’s outdoor lifestyle with apartments that have both front and back yards,” said Mr Pomroy. “A place where residents could embrace the views to the north and the east, whilst also giving opportunity for interaction with the street,” he said of the development located on Mitchell Avenue and Sutherland Road. “Capitalising on the area’s temperate climate, the breezeway elevates the traditional corridor to a space where residents can socialise with their neighbours in a pleasant open-air setting,” said Mr Pomroy. The façade helps frame views and create privacy for balconies.